Bobs are more than just a type of hairstyle; it’s a statement! It imbues independence, strength and a crossover to modern times. Nowadays, a bob is one of the chicest ways to update one’s mane. Versatility is not lost with its shorter length. You can go for an edgy look with an angled cut or opt for a romantic touch by adding soft waves. Rita Ora just became master of wearing bob hairstyle. In case you were thinking..
Rita Ora just became master of wearing bob hairstyle. In case you were thinking that you can’t create too many different styles with this hair length, here is counterargument. Apply generous amount of hair cream and blow dry your hair with medium size round brush. Side part your hair, rub small amount of creme between your palms and apply it to the side sections. Comb the left side and tuck it behind your ear. Comb the right side until sleek and pin it on the back of your head, leaving crown and back sections to conceal the pin. Remember the key word – sleek! Not the same as “wet look” by any chance, so stick to creme instead of gel. Model Hilary Rhoda opted for looking fresh with her casual waves at CFDA Fash.. Apply small amount of volumizing hair cream or mousse on dump hair. Few drops of shining serum are also more then welcome. Blow dry your hair until it is 90% dry. Divide your hair in two sections – upper (above your ears) and lower. Collect upper section, twist it firmly. coil it into bun and secure with elastic. Repeat the same with lower section. Best result is achieved if you wait for couple of hours before loosening these buns. Finger comb your hair thoroughly and pull your bangs to the side. Mist with hairspray. Too bad this picture can not include the perfection of this hat supplementing Chri..
Too bad this picture can not include the perfection of this hat supplementing Christian Siriano gown, for which Coco Rocha opted at CFDA 2014. Sleek hair is providing elegance level required for this outfit. Her blunt bob is parted on the side, tucked behind ears, generously treated with wet look gel and combed for polished sleek effect. When it comes to this hairstyle, we totally say ‘yes’ to the vamp drama of her lipstick. We give thumbs up for this angelic blond edition of catwalk’s most favorite redha..
We give thumbs up for this angelic blond edition of catwalk’s most favorite redhaired lady! Lily Cole opted for some nonchalance in her curls but without crossing on the side of messy. Caution for DIY! – after using curling iron, set your locks to the place with your fingers only and don’t fingercomb your hair too much. Hairspray is very good idea at this stage. Bob is too short to be feminine? Are you sure? 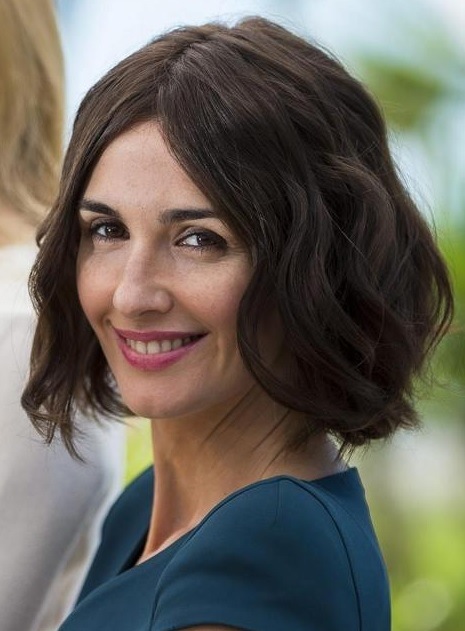 Spanish actress Paz Vega (Maria Callas in “Grace of Monaco” movie) appeared at..
Spanish actress Paz Vega (Maria Callas in “Grace of Monaco” movie) appeared at Cannes Film Festival 2014 wearing this lovely blunt bob. Her thick, brown hair is full of volume, appearing natural and effortless. Secret? Well formed beach waves. It is amazing what they can do for bob hair length, right? There is something Audrey Hepburnish about Zoe’s style for Summit Entertainmen.. There is something Audrey Hepburnish about Zoe’s style for Summit Entertainment 2013. Her look was tip-to-toe all about elegant simplicity. Her hair is cut into ultra short bob and feathery wispy bangs are emphasizing her gorgeous facial features. Keep in mind that zero frizz is allowed for this hairstyle! Take small amount of antifrizz serum, rub it between your palms and apply it to your hair before blow drying. Depending on your hair texture, you might need a few seconds of flattening iron action on your bangs. Let’s go back for a moment to 20’s when this hairstyle was the expression of reb..
Let’s go back for a moment to 20’s when this hairstyle was the expression of rebellion (against traditional long hair and complicated updos), pushing the limits and being forward in such a sophisticated way. Seems like it will never lose its elegance and glam, as even now, almost hundred years later, you can not look anything else but breathtaking and perfectly styled when wearing it. We would also add that smokey eyes makeup and red lipstick are not really optional… it is rather a must for completing the style! You do know that making fingerwaves does not include heat treatment for your hair? You did not? Ah, you are most welcome! Short shag hairstyles tend to look a bit sharp, but with the right touch of waves..
Short shag hairstyles tend to look a bit sharp, but with the right touch of waves the whole look modifies. Rihanna’s hair is cut asymmetrically into a short shag, giving this look a bit of an edge. What most certainly effeminates her look is the middle parting, side-swept long bangs and the firm, well defined curls. Long or medium, icy blonde (blinding blonde is more like it) or brunette, our hea..
Long or medium, icy blonde (blinding blonde is more like it) or brunette, our hearts cheer for Emilia Clarke! The Game of Thrones’ stare-at-me-too-long-and-my-dragons-will-fry-you-and-your-clan-without-remorse actress attended the 4th Season premiere of the much-loved series with her hair in elegant retro curls. Despite clearly being well-defined, the vintage curls maintain a touchable texture and good shine. Based on Emilia’s smile, she knows she pulled this one pretty well. You go, girl! Yep, blogger Nicole Warne definitely looks good in that long blunt bob, but let us.. Naturally smooth, straight, and fine strands? If you answered yes to both, save this photo and show it to your stylist then work that blunt bob with attitude! Kellie Pickler proves that blondes have more fun with her short, playful, curly bo..
Kellie Pickler proves that blondes have more fun with her short, playful, curly bob hairstyle. Layers are added to give the hairstyle movement and bounce. Kellie’s blonde hair is full of curls for a special evening out. She wore this hairstyle to the American Country Music Awards at the Mandalay Bay Hotel and Casino in LasVegas, Nevada in 2013. The short hairstyle looked great with her Badgley Mischka gown. As warmer weather is approaching, many women want to start wearing their shorte..
As warmer weather is approaching, many women want to start wearing their shorter and blonder. Katherine Heigl’s short bob hairstyle with subtle layers and side bangs is a great look for spring and summer. Her sunny blonde hair brightens are face and makes her blue eyes sparkle. To get rid of the cold weather blues, go to the salon and ask for a bob haircut and highlights. Taylor Swift recently jumped in on the short hair trend in Hollywood! Well, sort..
This…..Is……Fabulous! 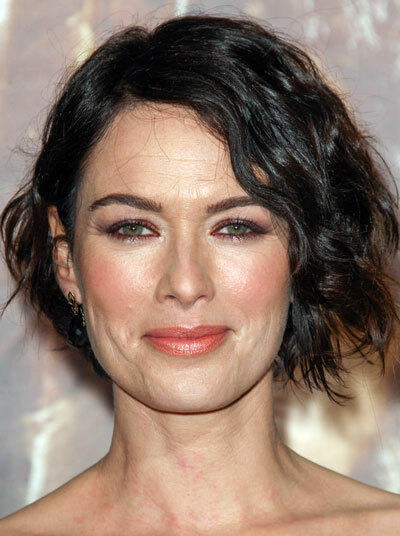 The gorgeous ‘300: Rise of an Empire’ actress attende..
This…..Is……Fabulous! The gorgeous ‘300: Rise of an Empire’ actress attended the Los Angeles Premiere sporting an angled bob with loads of texture. Effortless waves resulted in a disheveled look that’s far too hip to ignore. A hair product (we like Aquage Uplifting Foam) with a good texturizing power with zero build up is what you need to make this work. Apply a small amount before curling your mane. Katharine McPhee’s brunette hair is styled in a trendy faux bob hairdo. Celebriti..
Katharine McPhee’s brunette hair is styled in a trendy faux bob hairdo. Celebrities like Taylor Swift and Katy Perry love the faux bob. Girls with long hair can experiment with a shorter look without chopping off their locks at the beauty salon. Faux bobs look best on girls with long layered hair. To style, create messy waves with a styling product, a diffusing hairdryer, and lots of scrunching. Then, tuck the longer layers of hair under in the back leaving the top layers loose. Fun, neon-colored hair barrettes make the look playful and flirty. Katherine Heigl’s golden blonde hair is cut in a shoulder-length hairstyle with su..
Katherine Heigl’s golden blonde hair is cut in a shoulder-length hairstyle with subtle layers. This classic hairstyle is very simple and low-maintenance. Apply leave-in conditioner to damp hair. Then, blow dry hair straight using a paddle brush. There is no need to use a flat iron unless your hair has a lot of natural curl. Turns ends slightly under as you dry. Apply a small amount of styling product to dry hair to tame frizz. Katharine McPhee’s golden blonde hair is cut in a short, chin-length bob hairstyle..
Katharine McPhee’s golden blonde hair is cut in a short, chin-length bob hairstyle with soft, subtle layers around her face. For women with naturally-straight hair like Katharine, this is a simple, low-maintenance hairstyle. Her hair can be worn pushed behind her ears for a sleek elegant look like in this photo or down and loose around her face for a casual, flirty, sassy look. For the 19th Annual Gotham Independent Film Awards in 2009, Kristen Wiig wore..
For the 19th Annual Gotham Independent Film Awards in 2009, Kristen Wiig wore a faux bob hairdo. This hairdo is a fun option for women with long hair to play around with a shorter bob hairstyle without actually cutting it all off at the salon! The length of Kristen’s blonde hair was tucked under in the back and secured with pins. The shorter layers in the front were left loose and curled in spiral ringlets to frame the face. This is a very pretty, formal hairdo.